Fribourg Old City, one of the best maintained in Switzerland, sits on a small rocky hill above the valley of the Sarine. The town was founded in 1157 by Berchtold IV von Zähringen. Its name is derived from German frei (free) and Burg (fort). Its most ancient part is conveniently located on a former peninsula of the river Sarine, protected on three sides by steep cliffs. 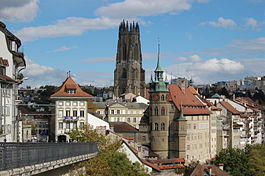 This article uses material from the Wikipedia article "Fribourg Old Town", which is released under the Creative Commons Attribution-Share-Alike 3.0 License.